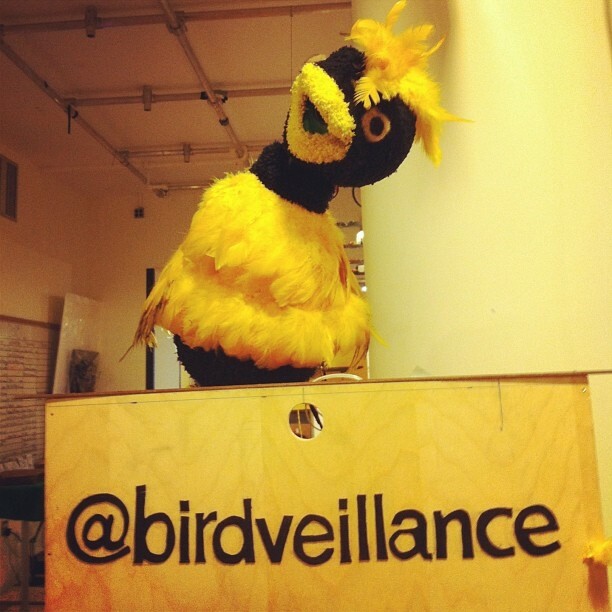 Birdveillance (@birdveillance) is a surveillance bird. This friendly creature looks like a bird, sings bird songs, and behaves like a bird, incorporating Perlin Noise into its darting blackbird-inspired motions. Taking the form of a golden oriole, Birdveillance awakens from its slumber to follow your face with a playful coquettishness as you walk by. You look up for a moment to determine the source of this indoor birdcall, and might even chat with the bird itself, before resuming your human activities in the hallway. But at that moment, a light flashes! The bird tweets! And the Twitter account @birdveillance Tweets a photograph of your face, accompanied by a speech-to-text snippet of your conversation. “Fundamentally, surveillance is a business model of the Internet,” according to Bruce Schneier, a cryptographer who is attempting to rally internet engineers to fight back. We thought that a bird who “tweets” in both senses of the word would be a great way to draw attention to surveillance and make us all more aware of the ways that formerly private information is increasingly accessible online, whether it’s via NSA spying or tweets of our own volition. This is a collaboration with Yiyang Liang from ITP’s Introduction to Physical Computing and the 2013 Winter Show. We built the bird with a plastic apple, tupperware, flour, toe socks, feathers, glue, duct tape, and a wooden birdhouse.